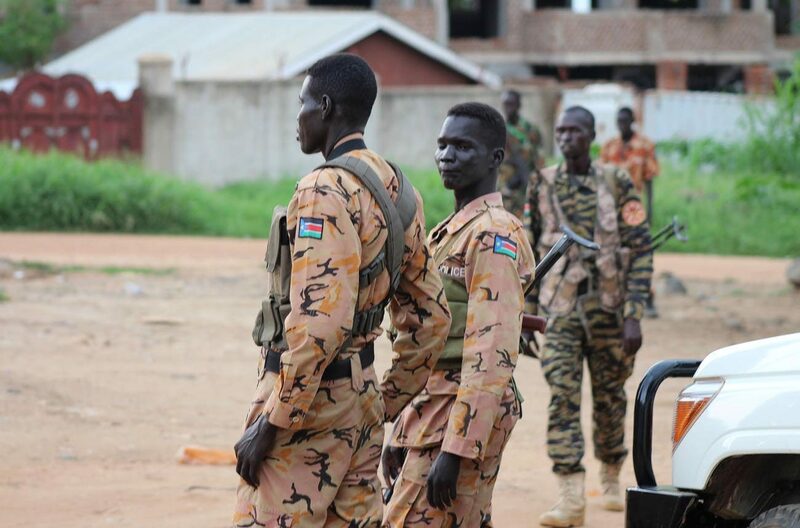 JUBA, South Sudan (CNS) — South Sudan’s church leaders said they are extremely disturbed about heavy fighting in the capital, Juba, which has raised widespread fears that the country is returning to civil war. “We pray for those who have been killed, and for their families, and we ask God’s forgiveness for those who have done the killing,” the leaders said in a July 10 statement read on national radio. “However, we also urge repentance and a firm commitment from all armed individuals, forces and communities, and from their leaders, to create an atmosphere where violence is not an option,” they said. Violent clashes between forces loyal to the president and those loyal to the vice president spread across the city July 10, a day after South Sudan’s fifth anniversary of its independence. The outburst was a resumption of fighting two days earlier in which at least 100 people died. “We, the leaders of the church in South Sudan, are extremely disturbed about the fatal shootings” in Juba, said the church leaders’ statement. “We make no judgment as to how or why they occurred, nor who is to blame, but we note with concern that there have been a number of incidents recently, and that tension is increasing,” the council said. Archbishop Paulino Lukudu Loro of Juba represents the Catholic Church on the council. For nearly a year, South Sudan has been trying to emerge from a civil war caused by political rivalry between Vice President Riek Machar and President Salva Kiir. The rivalry began in December 2013 and has left tens of thousands of people dead. The church leaders said that they were encouraged by a joint call for calm issued by Kiir and Machar after the July 8 violence that began outside the presidential compound in Juba where they were meeting. “We add our voices to theirs and urge soldiers and civilians to refrain from provocative words and actions, and to do everything in their power to avoid escalating the situation,” the council said.